Software Title Authorship: SUPERSHOPPER, SHIPS IN THE NIGHT, FLAGS, THE BOATYARD, REAL ESTATE PROFIT CALCULATOR, SECRETS, ADVANCED ANIMATION TUTORIAL, and other programs and web sites for microcomputer users. Some years ago, after completing a book about HyperCard for Que, I swore never to write another. Writing a book is much like childbirth, I believe. In the beginning, it gestates slowly, usually over a few months or even years. Then it ramps up inexorably and quickly toward deadline, until all attention is focused upon the delivery itself, and the pain and workload are great. Editors cry, "Push." Afterwards, you remember it was rough, but memories of the pain itself become diffused, and one is only too easily persuaded to do it again. 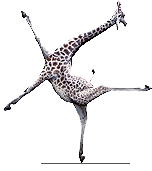 This particular giraffe was happily discovered at www.microfocus.com/solutions/cobol, demonstrating how it is when writing feels good.